Oakland Athletics left fielder Yoenis Cespedes left Tuesday’s game against the New York Yankees with tightness in his left hamstring, a decision made by the Athletics as a precautionary measure so as not to risk the chance of welcoming further injury to the young slugger. Cespedes will be considered day-to-day and will not be placed on the disabled list. The Athletics will most likely place the outfielder in the DH spot for the next few games to rest his hamstring and relax any tightness that could escalate to serious injury. 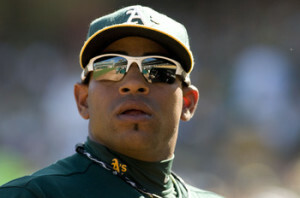 Cespedes spent time on the 15-day DL in mid-April after straining a muscle in his left hand following an awkward slide. On the season Cespedes has put up decent numbers for the Athletics, posting a mediocre .240 batting average with 13 home runs and 35 RBI in 52 games this season. Cespedes finished second in American League Rookie of the Year voting and tenth in AL Most Valuable Player voting last season, following a strong rookie campaign in which he belted 32 home runs and drove in 82 runs.